Occasionally people ask me: ‘How do you manage 13 godchildren?’ And my answer is simple: ‘You’d have to ask them.’ And it would be quite a task, as they range from aged three to 54 and are scattered all over the world. But I think they’d probably agree that, although I love them all dearly, I have failed badly in my godparenting duties of advice, outings and gifts. Having discussed it with other godparents, it seems I’m not the only one who doesn’t live up to their responsibilities. Apparently, Queen Victoria had about 50 godchildren, many of whom she ignored even though some were named after her. None of mine were named after me — Joan, after all, is a very boring name — but I do have something in common with the great lady on that front. And I didn’t. I ignored the poor child until he became a teenager and became more interesting, and we started to become close — a bond that is even more intense following the death of our beloved sister, Jackie, three years ago. It was only six months after I found myself with my own baby, my beautiful Tara Cynara Newley, that I acquired my first godchild, Adam Bricusse. It felt like a double blessing. Adam’s father is the lyricist Leslie Bricusse, the song-writing partner of my then husband, Anthony Newley, and his mother the film actress Yvonne Romain. We all were extremely close and spent years going on holidays together. 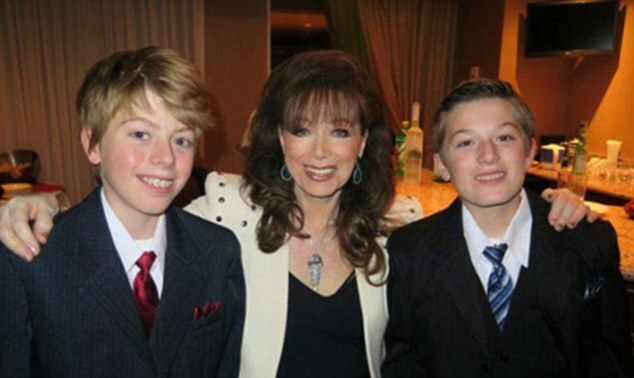 When my baby son, Sacha, arrived about a year after Adam, they became best friends for decades. When we went to look in his cot, we found cockroaches crawling all over his crib and up his baby-gro. Never have two families packed so fast as we did to evacuate that infested house. Eight years later, my best friend, Judy Bryer — my personal assistant when I was starring in Dynasty — produced her first-born, Victoria, and I was delighted to be asked to be a godmother for the second time. 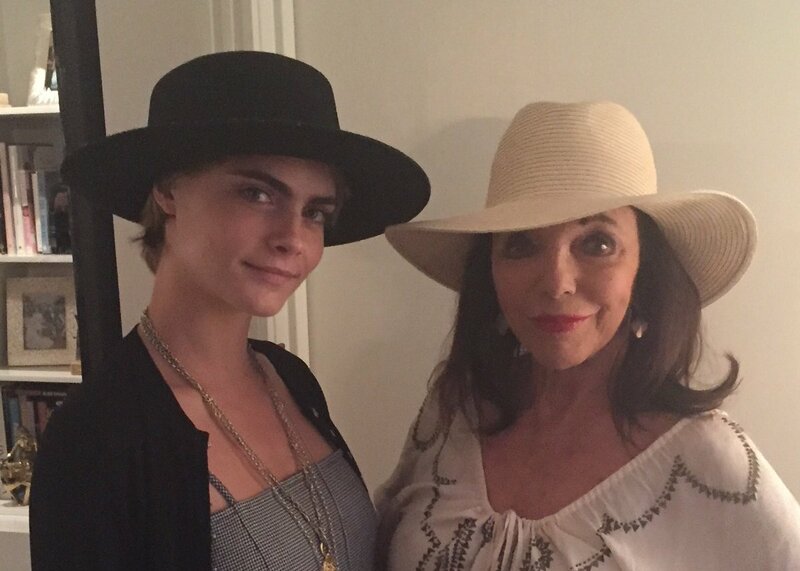 Victoria and I have kept in constant touch, as she is almost the same age as my youngest daughter, Katyana..
CATWALK STAR CARA: Model and actress Cara Delevingne, 26, daughter of my life-long friends Charles and Pandora. Two godchildren were entirely manageable and a huge honour, and I went into each relationship with the very best of intentions. I dutifully remembered birthdays, and chose thoughtful presents. But then, all of a sudden, I seemed to become inundated with invitations to ‘godmotherhood’. The births came fast and furious in the Seventies: there was Milica, daughter of interior designer Tessa Kennedy and prolific film producer Elliot Kastner, of Where Eagles Dare fame, among many others. Rachel, the daughter of Rod Tyler, then news editor of the News of the World, and his wife Maggie, who was our personal assistant, was also born in the Seventies. Then came Scott, son of Eddie Sanderson, my favourite photographer, and Christian, son of Luisa and Roger Moore. By now I was struggling to keep up with remembering all of their birthdays. I did my best, but it was so difficult I decided instead to give a festive children’s Christmas party every year. This proved extremely successful and kept both parents and kids — including my own — happy for a few years. But as this group turned into teenagers, the novelty of Christmas parties, stocking treats and ‘ho-ho-ho’ Santas grew stale, and they came to a natural end. Not that that was the end of the godparenting requests! As the Eighties dawned, my younger friends started producing babies. 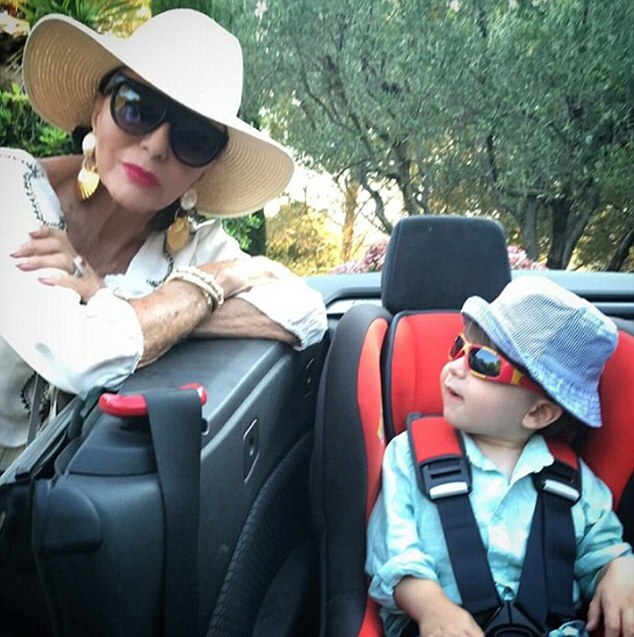 FILM MOGUL’S BABY: I first met Milica Kastner in her cot in the South of France when she was three months old. Now 46, she is the actress daughter of the late American film producer Elliot Kastner and Tessa Kennedy, a British interior designer, who is godmother to my daughter Katy.. In quick succession, I was asked to become godmother to Chloe, daughter of Neil Dickson (who played Biggles), with whom I was working on my mini-series ‘Sins’; then Coco, daughter of Louise and Theo Fennell, the fabulous jeweller. By this time, I had practically given up on all of them. I sent a Christmas card every year which was often returned with a ‘Not known at this address’ sticker. 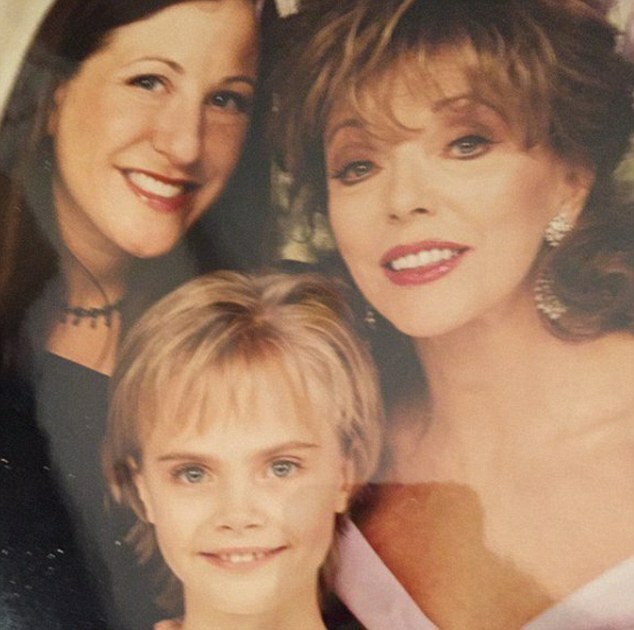 BEST FRIEND’S GROWN-UP GIRL: Victoria Dade, pictured here with me and a young fellow goddaughter, Cara Delevingne, is daughter of my closest friend Judy Bryer. Her father is Californian businessman Maximilian Bryer, who gave me away when I married my husband Percy Gibson in 2002. Victoria, now 46, has two sons and works in the U.S. broadcasting industry..
Then when, in the Nineties and early 2000s, my grandchildren were born, there weren’t enough hours in the week to keep in touch with many of them. Being a godparent is supposed to mean acting as a referee for the child and their parents from their baptism to adulthood. Nowadays, it’s all about remembering Christmas and birthdays and dishing out iPads and iPhones as presents. Another definition of a good godparent is that they will make themselves available at all times to the child, keeping in touch regularly. Sorry guys — I guess I dropped the ball on that one, too. As a working actress, mother to three and grandmother to three, I could only be counted on in emergencies. Of course, she didn’t listen and has become monumentally successful in both her acting and modelling careers. 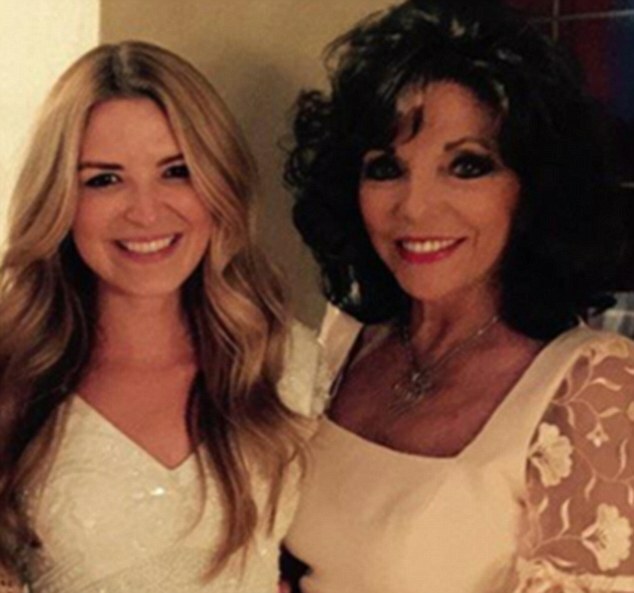 Just a few weeks ago we went out to dinner, and I took my 19-year-old granddaughter, Miel, to Cara’s 26th birthday bash in Los Angeles. I do try to keep in touch with them all. I see Christian Moore and his gorgeous young children often in the South of France. 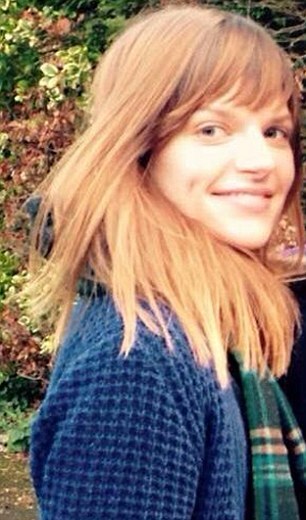 Christian has just had his fifth baby — a gorgeous little girl called Lily-Lara. And Adam Bricusse, my first godchild, is now godfather to her! Now that my godchildren are having children of their own, does this make me a great-godmother? The early 21st century has seen something of a renaissance for my godparenting duties. My friend and producer Charles Duggan, who is gay, informed me he was going to become a parent through in-vitro fertilisation. Since his twin sons, Declan and Justin, were born in 2002, we, too, have spent several summers together. 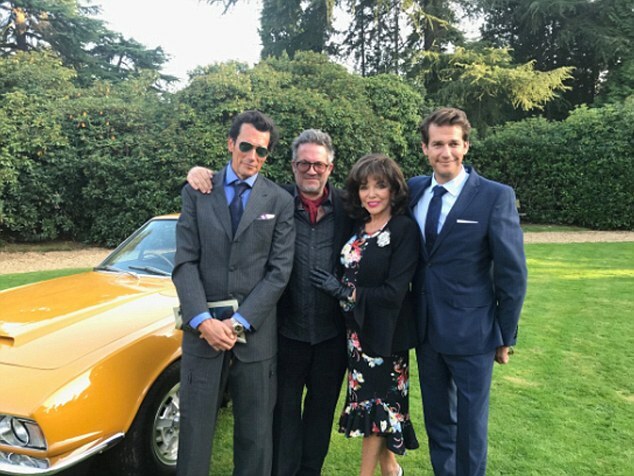 FIRST GODCHILD AND 007’s SON: Artist Adam Bricusse, left, is the 54-year-old son of lyricist Leslie Bricusse, who worked with my second husband, Anthony Newley. Film producer Christian Moore, 45, is the youngest son of my friend Roger Moore..
Then, in 2015, another of my gay friends, Ivan Massow, asked my husband, Percy, and me to be godparents to his beautiful baby boy, Theo. To be fair to myself, I am now in regular touch with most of my godchildren, inviting them to my parties whenever they are in town and getting to know and love their own children. As far as the requests go, I think I’ll definitely stick at 13. Unlucky? I don’t think so. So, from married parents to single parents to gay fathers, god-parenting has changed a lot in the past 50 years. I have been happy to have been even a small part of my godchildren’s lives, if not the most active of influencers. I love all of them wholeheartedly.